After finishing runner-up last year, Josef Newgarden started on the pole on Sunday and cruised to victory in the Kohler Grand Prix at Road America. Newgarden held the lead for 53 of the 55 laps. The only time he didn’t lead came while he was in the pit. 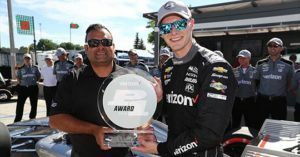 It’s the third victory of the season for Newgarden but his first at the Road America course. Ryan Hunter-Reay finished second and Scott Dixon was third. The race was run without a single caution, the ninth time that has happened in Indy-car history and first since 2000. Before the race, track president and general manager, George Bruggenthies, announced a three-year extension, through 2021. The Johnsville Sausage 200 went to double-overtime Saturday at Road America in NASCAR Nationwide Series Racing. In the end, A.J Allmendinger took the checkered flag for his first career NASCAR victory in a green-white checkered finish. Justin Allgier took 2nd place while Parker Kligerman finished 3rd. This was the 4th straight year the Elkhart Lake track has hosted a Nationwide race. According to Dave Kallmann of the Milwaukee Journal-Sentinel, the track is hopeful that in can someday host a Sprint Cup race. The NASCAR Nationwide Series returns to Road America in Elkhart Lake Saturday for the Johnsonville Sausage 200. It’s the 4th year that series comes to the 4-mile track in Wisconsin. The first race was held in 2009 with Carl Edwards taking the checkered flag. Nelson Piquet Jr. is the defending champion. The NASCAR Nationwide Series hits the road course at Road America in Elkhart Lake this weekend. The Sargento 200 is on tap Saturday afternoon (2:30pm). Reed Sorenson is the defending champion after last years leader Justin Allgaier ran out of gas on the final lap.